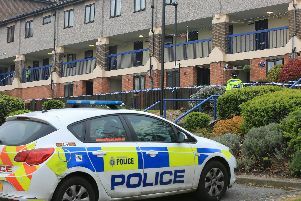 Shocked residents have spoken of how they saw cars speeding through a Sheffield suburb shortly before a crash and stabbing. Emergency services were alerted to a crash on Burncross Road, Chapeltown, at around 7.30pm yesterday and when police officers arrived they discovered that following the collision there was an altercation during which two men was stabbed. The two cars – a Mazda and Volkswagen Golf – collided at the roundabout near to Tesco Express. Two men, aged 21 and 25, who were in the Golf, were attacked by two men in the Mazda, who then fled. Residents discussing the incident online claim to have seen cars speeding through the area beforehand. Before the crash, Amanda Burrows issued a warning on Facebook. She wrote: “Careful driving on Burncross Road – two cars racing, ploughing through moving traffic, centimetres close. She said the driving had seemed ‘aggressive’. Detectives investigating the crash and stabbing have not yet revealed whether the reports of earlier speeding were connected. A large cordon was put in place around the crash scene in the aftermath of the incident as officers gathered evidence and attempted to piece together exactly what happened. Witnesses or anyone with information should call South Yorkshire Police on 101 and quote incident 767 of April 16.